12 months (or so), 28 countries (although some of them are very very small! 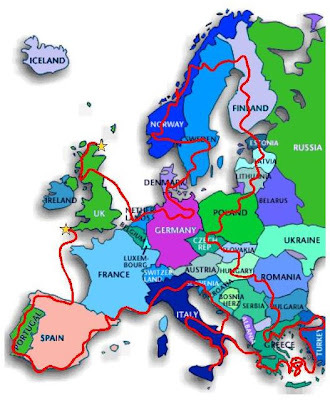 ), an estimate of 15,000 miles (or that's what we've told the insurance company...), the current plan is to come home when we get bored, run out of money or hate each other - whichever happens first! We plan to have enough of a plan from time to time to enable those that can and want to, to find a cheap flight and come visit us (with a bit of notice) and all welcome! "cheap is good and free is as good as cheap gets..."
but your route misses out the vital first step from Cambridge to land's end... looks like you will spend your year of early retirement stuck on the drive in Balsham.